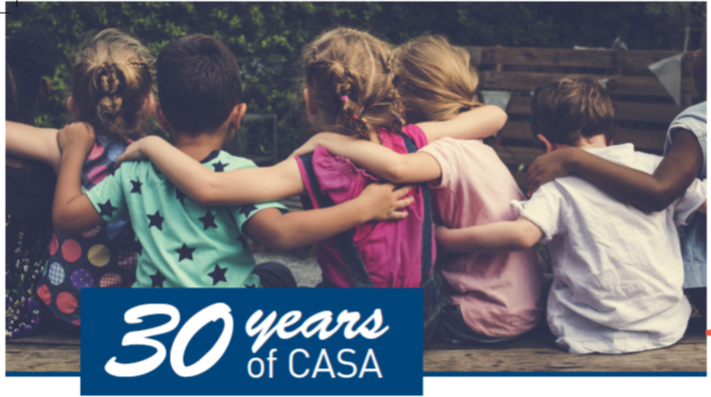 CASA of Morris and Sussex Counties’ 30 year history has been shaped by over 1,400 volunteers who advocated and mentored 5,789 children and youth, who were victims of abuse, neglect and abandonment. These children’s lives have been forever changed. They have been given a chance to see beyond their circumstances and envision a future filled with opportunity and hope because of the dedication and advocacy of CASA volunteers. We have achieved our vision of assigning a CASA volunteer to every child in foster care in our two counties. 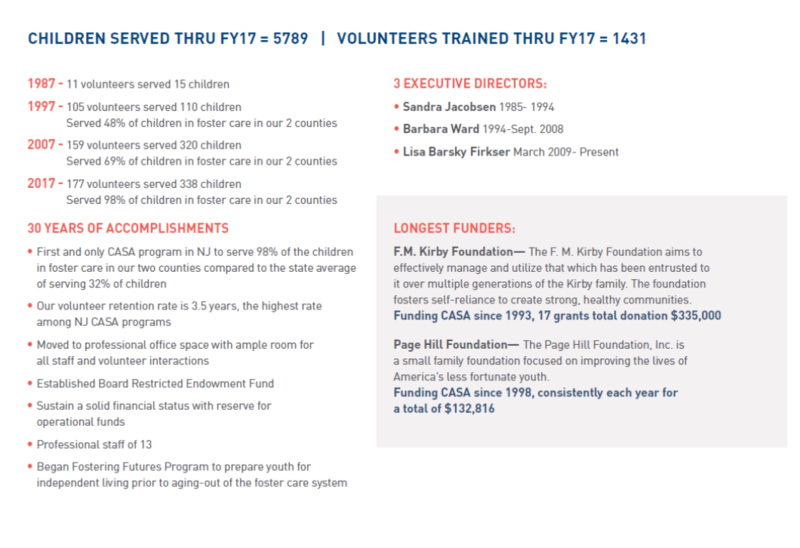 We are the only CASA program in NJ that has accomplished this and we could not have done it without all of YOU. 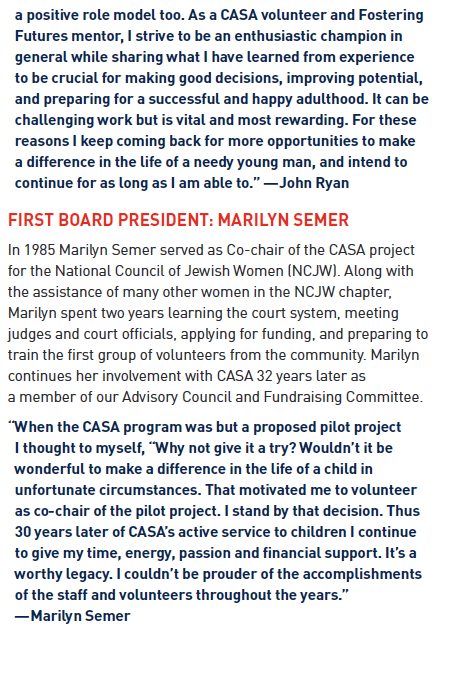 Our Volunteers, Staff, Trustees, and Donors… You are the ones who have built the foundation of CASA of Morris and Sussex Counties and supported the work of bringing better tomorrows to vulnerable children. Thirty years since our beginnings and child abuse and neglect are not diminishing. A child’s emotional, physical, and mental well-being is fragile and easily compromised. We will not stop our work until the time when all children are protected from harm, live in a permanent and stable family environment, and receive the services that will meet their developmental, educational, physical, and mental health needs. Thank you for partnering with us to ensure that we continue to provide valuable advocacy to every child until he or she has a safe, nurturing, permanent home. Child Advocacy: Children who are victims of abuse, neglect and abandonment and living in foster homes or residential facilities are assigned to trained volunteers for advocacy in the Family Court system. CASA volunteers make recommendations to the court for critical community resources and services to improve a child’s stability and outcomes. Volunteers also ensure that each child is in a safe, nurturing, and permanent home as soon as possible. Volunteer Recruitment and Training: The process to become a CASA volunteer advocate includes recruitment, orientation sessions, interviews, background checks, 6-weeks of combined classroom and online training, swearing-in ceremonies presided over by the Family Court Judges, and case assignment. Additional In-Service training is provided for our volunteer pool throughout the year. Fostering Futures: The goal of this Program is to improve outcomes for youth ages 14-21 who will be aging-out of the foster care system. It incorporates the following three strategic components. 2) Mentoring: to identify the youth’s strengths, areas for improvement, and the resources and services needed to establish the youth on a path toward a healthy, productive life. The emphasis is on life skills such as work and study habits, maintaining healthy relationships and daily living activities. 3) Coaching: to help youth reach their full potential by promoting a positive self-identity with goal setting, action plans and identifying and using community resources. Youth Centered Advocacy Program (YAP): CASA volunteers advocated to facilitate the movement of youth detained at the Juvenile Detention Center to an alternative, less restrictive environment. Make a tax-deductible donation of cash or appreciated securities. Honor a family member or friend by sending a tribute card: in memory of, in honor of, thank you, happy birthday, etc. Our community came together to provide birthday presents, holiday gifts, beach towels, backpacks, school supplies, teddy bears, toiletries, and smiles for over 350 children in foster care.